Hi everyone. 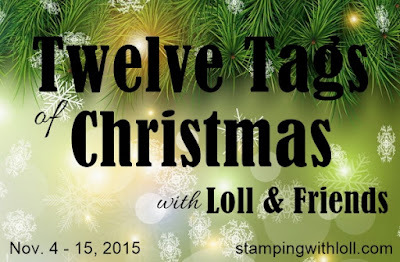 Welcome to Day Two of the Twelve Tags of Christmas event. Rules and Prizes for the Challenge are listed in the right-hand column, just below the Twelve Tags Badge. Please make sure you follow the rules in order to be eligible for the prizes. Thank you!! Brushos background and dyed ribbon. Torn snow drifts and glitter stenciling for added sparkle. Crackle paste on deer, then sponged in gray. Today Kathy K (Purple Princess Diaries) is Guest Designing. Kathy LOVES mixed media and techniques and is always experimenting. I have learned a lot from her posts ... and have enjoyed trying some of the techniques that she explains. Thanks so much for all the great info and wonderful cards, ATCs, tags and canvases that you make Kathy ... fabulous inspiration to me and many others! LOVE the soft background for the beautiful die-cut tree and snowflakes. The rhinestones and the "snow" at the bottom add such beautiful sparkle and shine. Jules (Crafted by Jules) is an extremely talented card maker. She inspires me with her beautiful cards which are creative, unique and oh-so beautiful. I am in awe of her watercoloured cards ... they are jaw-dropping gorgeous! Drop by her blog to get the details of her amazing tag below. 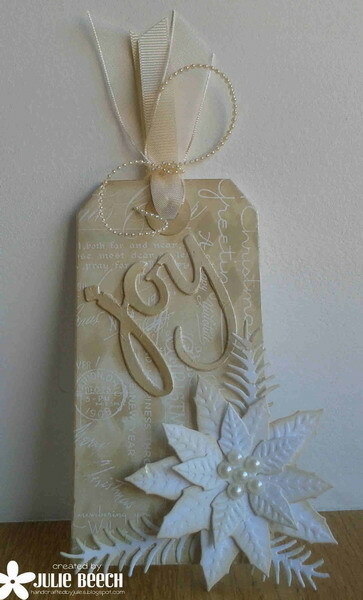 I LOVE the monochromatic colours of this tag ... it's beautiful, elegant and serene. I'm also playing along with Happy Little Stampers November Christmas Challenge - Tag. Come join in the fun there too and link up your Christmas Tag! Thanks for having me as your GD, your comments make me blush Loll! Love your's and Kathy's tags. Another beautiful tag Loll. I am really loving the soft blues and greens I am seeing in the Christmas tags this year. These are gorgeous! Love the soft, neutral color of Julies and Kathy's background is so well done as a backdrop for the intricate die cut tree accented with rhinestones. Loll, LOVE that flourish you added to your fantastic Brusho background! OMG Loll, Three more stunning and creative Christmas tags by you, Kathy and Julie. Your gorgeous Brushos background in blues with your matching ribbon really caught my eye. Loved your die cut swirls too. But my favorite part..your crackled paste reindeer...Stunning! 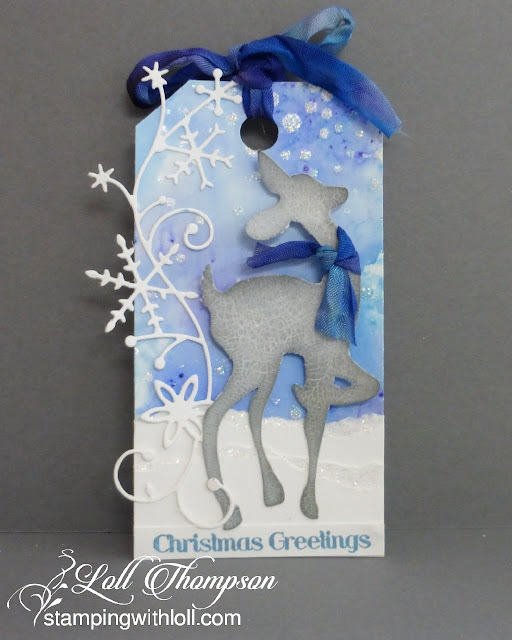 Kathy, your gorgeous background with your stunning die cut tree and Winter sparkle are amazing. Love that beautiful background with the snowflake border and snow drifts, Loll! And the crackled texture of that sweet prancing deer is amazing! I am loving all the inspiration. Thanks so much Loll for organizing such a great tag challenge! Three more gorgeous tags! I'm in awe as I love them so much. Love the crackle paste and the bow on your deer, Loll. Off to check out the details on the other two! Wow! Love your tag, Loll! Great techniques. I must visit Kathy & Jules. Beautiful work! More loveliness Loll. That little deer is so elegant and fits perfectly onto your tag. Kath's tag is gorgeous but absolutely love the tag made by Jules - gorgeous non-Christmas colours but works so well. A stunning trio, Loll...I'm especially smitten with the elegant die cuts featured on each one: the deer and swirly snowflakes on yours, the pretty tree on on Kathy's and the joy and poinsettia on Jules. More additions to my wish list! Your card and guest designers cards are so pretty!!! Today's tags are simply STUNNING! Love them all! Your tag is gorgeous, and I love seeing all the inspiration today! Count me in for this fabulous challenge, Loll! Another trio of wonderfulness, Loll.